Nothing brightens your front door more than a decorative wreath. These ten wreath tutorials will inspire you to make one for your home! The first paper craft tutorial offered, will teach you how to make a beautiful cream colored rose wreath. Hang this beauty on your door to welcome all who enter your home. The design works for every season of the year. This paper wreath design is striking, and its beauty will last a long time, unlike fresh flowers. Paper flower wreaths may be used for more than home decor. The "Downton Abbey" wreath is also perfect for an upscale affair such as a wedding or even a corporate event. It takes 24 roses to make the wreath so make sure you give yourself plenty of time to craft it. Don't wait until the last minute before your big day. An economical way to add elegance and sophistication to your wedding decor. You can learn how to make paper flower wreaths from the unlikeliest paper sources. Can you believe wallpaper is the secret behind this project? Most people don't! There is a trick that makes this wreath so pretty. The wallpaper flowers are surrounded by real greenery to give it a natural feel. A bit of nature always adds a beautiful touch to paper floral displays. Make a metallic paper hydrangea wreath for your front door and get ready for the compliments you will receive from your guests! The metallic sheen of the paper highlights the hydrangeas on the wreath and makes the design especially beautifully. A second bonus is that from far away the blooms almost looks real! Learn how to add dimension to your paper flowers with a two-color printing technique that is covered in the tutorial. Crafters that practice recycling will appreciate this wreath. This brightly colored wall hanging is made up from leftover bits and pieces of craft supplies. This flower wreath that will have you smiling every time you look at it! Not only is it beautiful, but it is helping mother earth in a small way! Paper tube crafts are always fun and never get old. Learn how to make flower wreaths from paper tube ring daisies. The best part about this wall hanging craft is that it only costs one dollar to make! A crafters dream! It takes approximately 120 rolled paper roses to make a stunning rose wreath. Don't worry, the author of the tutorial includes a free SVG file for download to cut these lovelies with your Silhouette machine. After you cut the roses, all you have to do is roll and glue. Make them while watching television, and you will have them finished before you know it! Do you have a lot of old books in your home that are sitting on your shelves collecting dust, outdated and never read? Don't throw them away or give them to a thrift store. Recycle the book pages into paper wreaths. This recycled book paper flower wreath is a craft that would work well as an Earth Day craft for children. It is both cute and thrifty! Daffodils are the flower of spring. Make this sunny wreath to adorn your front door. Hang it with a big bold yellow ribbon and it will bring cheer to all who enter your home. A Peony coffee filter flower wreath is for you if you are a fan of vintage or shabby chic style. 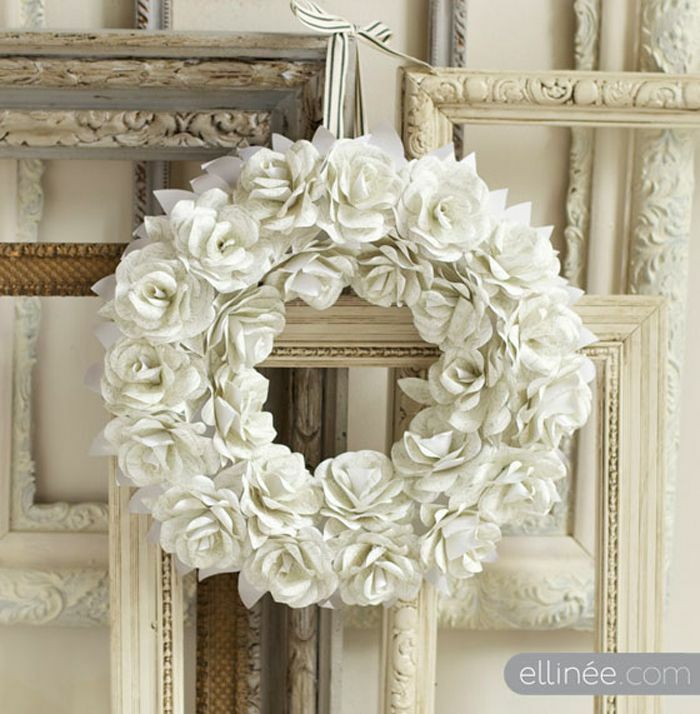 Learn how to make a paper wreath from coffee filters, and your shabby chic home will thank you. The wreath is delicately beautiful and quite feminine. It would look lovely surrounded by antique furniture or knick-knacks.